As anyone who has had a garden can attest, buying seed is one of the most exciting activities of the farming year. Seed-buying is always full of hope and promise—nothing has had the opportunity to go wrong… yet. But this winter was so busy, seed buying really got away from us. 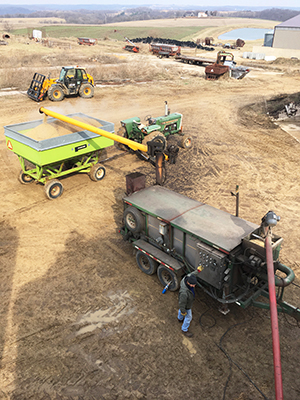 Winters are generally occupied with delivering hay and grain to a network of farmers in southwest Wisconsin, working in our shop, keeping up with farm maintenance, and planning for the next year. This winter we took on the additional task of designing and sourcing equipment for a granary that we’re in the process of building. Our goal is to build a facility to clean and store organic grains for the milling, malting, and distillery markets. By launching this enterprise, we will be able to add value to the crops we grow, have more control over how our grains are marketed, and build equity in the farm operation where we work. It’s an exciting project, but it made for an extremely busy winter. In December and January, there’s always a feeling that the entire winter still lies ahead and there’s plenty of time to pull together acreages, assign fields, and talk to seed dealers to select our varieties. But this year our main seed order was not finalized until the first week of April. Most of our seed comes from Albert Lea Seeds, an invaluable resource for Upper Midwestern grain farmers. Albert Lea is supplying us with the bulk of our seed this year, but in our search to find older landrace varieties, we had to really go digging. Roasting soybeans – one of many winter activities. For vegetable farmers, there are amazing seed dealers out there, and when you want to plant eggplant, you’ve got easy and reasonably affordable access to dozens of varieties. When you’re a grain farmer looking to plant older landrace varieties of wheat, the seed is either unavailable or prohibitively expensive. In our case, networking is invaluable, especially with universities that are trialing older varieties. This year we’re buying some seed from a farmer colleague, some from a university, and we’re raising some seeds that we grew ourselves from a small amount of very expensive seed. For other grains, namely buckwheat and rye, it is very challenging to find milling-grade varieties in a region where those grains are mainly selected for their cover crop performance. As we navigate these decisions, we have a lot of support. Our farming situation is remarkable. We work for a farmer, Paul Bickford, who has land and a full array of equipment: tractors, plows, cultivators, combines, and more. Paul has been very generous in allowing us to have a big impact on the crops we grow and how we market our grains. Because of this arrangement, we have a lot of control over our days and our farming careers, and we’re not in a pile of debt (though that’s looming on the not-so-distant horizon when we assume ownership of the farm). In addition to having access to land and equipment, working with Paul and other farmers in our community provides us with mentors we can lean on when we’re out of our depth. Paul has been farming nearly his entire life: grazing, dairying, and growing conventional and organic crops. He’s done it all. He’s also a great teacher with a keen eye for efficiency and common sense. As with most things in life, the simplest solution is often the best, and we’re working hard to learn that skill on the fly. My father, Duane Wepking, has also been and will continue to be an invaluable resource. He’s been a lifetime non-chemical farmer, and although his farm has never been certified organic, he has operated under that ethos his whole career, despite the misunderstandings it may have precipitated between him, his community, and his parents and siblings. He’s been around cattle his whole life, and between his instincts and his accumulated knowledge, we feel well supported in the areas of farming where we are thinnest: experience and skill. For beginning farmers like us, there is no formal educational opportunity that could come close to replacing the value of having mentors. Despite all of the support we have, farming can still feel hectic. Winter is barely over and we’ve got calving coming up very, very soon. Maybe things will start to slow down for us next winter. We aren’t holding our breath for that, but even with the pace of life and work, we’re happy up on our ridgetop, building something completely new that will not only help to secure our fair share of grain income but will benefit other organic farmers in the area as well.